As such, today we’ll be finally reviewing the AMD Ryzen 7 1700X and 1800X, the flagship AMD Ryzen 7 CPUs with the highest clockspeeds and the highest pricetag to match. Let’s take a look at how these higher end SKUs stack up. Taking a look at the specifications, the AMD Ryzen 7 1700X and AMD Ryzen 7 1800X are both 8-core processors with 16-threads. The major difference between the two is the clock speed. Whereas the AMD Ryzen 7 1800X features a base/turbo frequency of 3.6GHz/4.0GHz, the AMD Ryzen 7 1700X features a base/turbo frequency of 3.4GHz/3.8GHz. 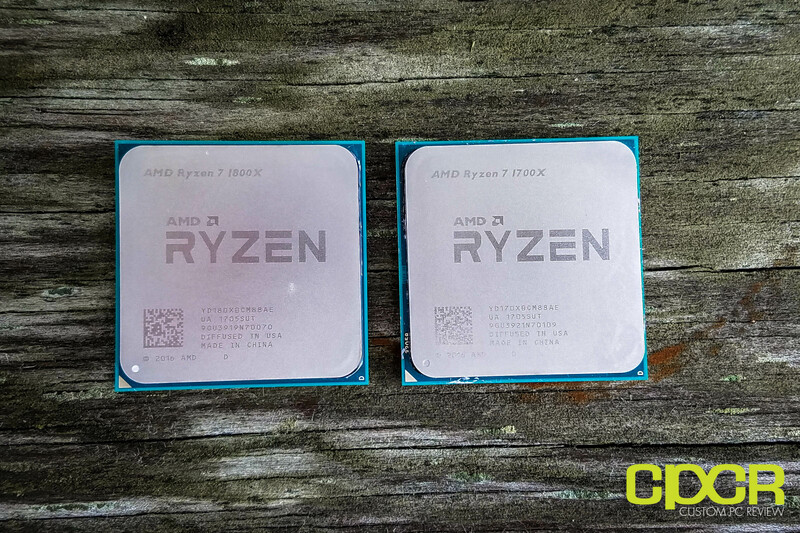 Compared to the AMD Ryzen 7 1700, the Ryzen 7 1700X and Ryzen 7 1800X are X-series CPUs which gives them higher clock speeds and increased XFR boost range. With XFR, the CPU has the ability overclock itself by an additional 100MHz if it determines based on internal sensor data that the cooling is capable of handling the additional heat. 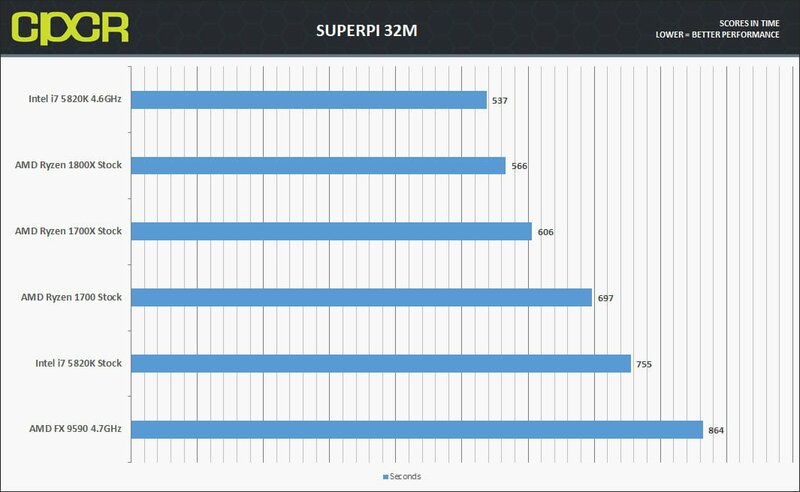 As such, TDP on the X-series CPUs are rated at 95W rather than 65W. 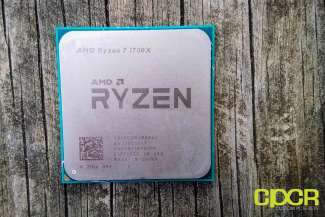 The new AMD Ryzen 7 CPUs will also require new AM4 socket motherboards which will be available on AMD X370, B350, A320, and A300 chipset based motherboards. As we all know by now, AMD’s Ryzen processors are built on AMD’s new Zen micro-architecture, the true successor to AMD’s Bulldozer architecture which was launched way back in 2011. 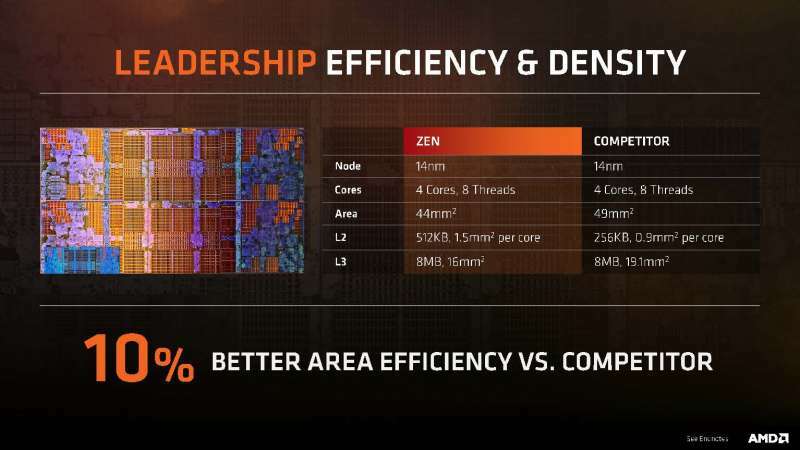 One of the major differences between Zen and Bulldozer is that Zen is now manufactured on GlobalFoundries 14nm FinFET process. By significantly reducing the size of transistors and cramming more into a specified surface area, AMD is able to attain massive performance and power efficiency improvements simply by transitioning to the newer manufacturing process. Prior to Zen, AMD has had a significant disadvantage in manufacturing process ever since 2011, being stuck on the 28nm process for its APUs and the 32nm process for its mainstream FX desktop lineup while Intel jumped from 32nm to 22nm and finally to its current 14nm. Unlike Intel which has its own manufacturing fabs, AMD had been at the mercy of its contract fabs, which simply couldn’t compete against Intel’s advanced manufacturing capabilities. However, thanks to the high level of difficulty in manufacturing past the 14nm process node, this has given AMD’s contract fabs a chance to catch up to Intel’s manufacturing capabilities. As far as core architecture, AMD has made some huge changes compared to the Bulldozer architecture, chief among them is the removal of the neutered core module design and instead favoring a full core with its own decoders, floating point operations pipelines and L2 cache. 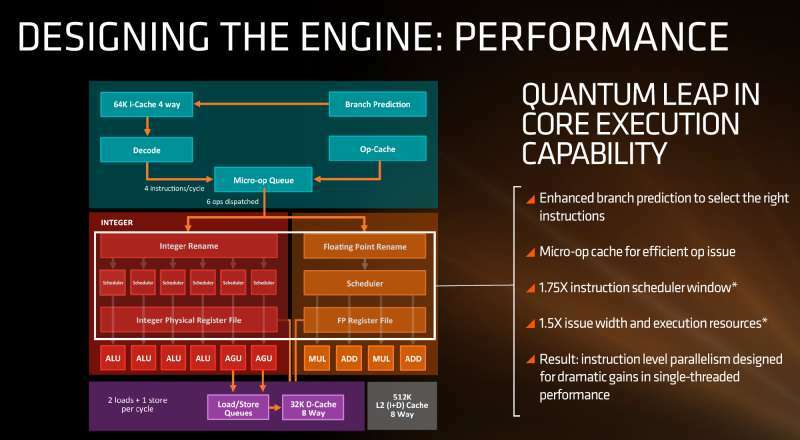 This is a significant departure from AMD’s Bulldozer architecture which employed modules which have two non-independent integer cores mashed together. While this seemed like a good idea at the time, in practice the two integer pipelines bottlenecked and Bulldozer’s floating point performance was worse than their older K10 architecture based Phenom II CPUs. While Piledriver sought to improve this with higher clock speeds and improved IPC, the core Bulldozer architecture simply couldn’t compete against Intel’s Core Series processor’s superior architecture. Additional major improvements in AMD’s Zen architecture include SMT, a new micro-op cache, and the implementation of a write-back cache. SMT, or Simultaneous Multi-Threading, is a new technology which will allow AMD Zen’s ability to process two threads on a single core, which is similar to Intel’s Hyper-Threading technology. The micro-op cache is a cache in Zen’s Front End which allows frequently used micro-ops to be cached within each core rather than having to utilize a fetch and decode cycle. This is something that Intel has been doing since the Core 2 Duo days and significantly attributes to the major IPC improvements in Zen. The access pattern of the L1 and L2 cache are now write back instead of write through. This significantly decreases the amount of time spent waiting for the cache to confirm a write which as a result will help significantly reduce latency. Speaking of cache, AMD now utilizes a three tier system consisting of a 96KB L1 cache (64K I-Cache + 32K D-Cache) per core, 512KB L2 cache per core and a 8MB L3 cache shared among the CCX (CPU Complex), a quad-core Zen CPU block. 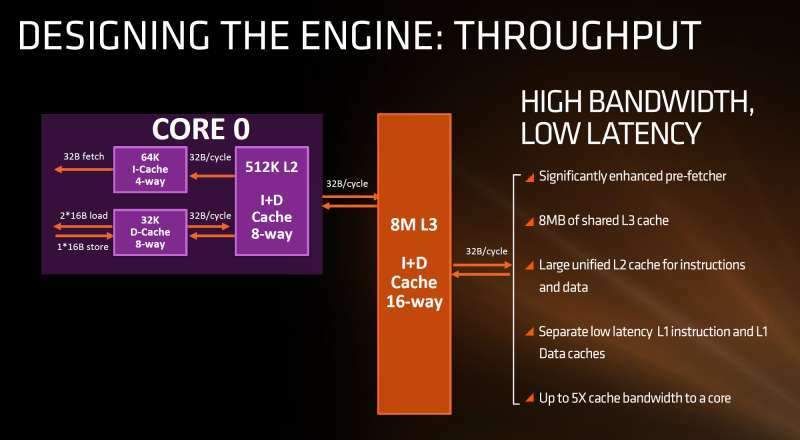 AMD Ryzen 7 processors utilize a dual CCX configuration interlinked by its high speed Infinity Fabric link which is why AMD claims that each Ryzen processor provides a full 20MB of L2+L3 cache. Overclocking on the Ryzen 7 series CPUs are relatively easy as AMD has left the multipliers unlocked on every CPU. 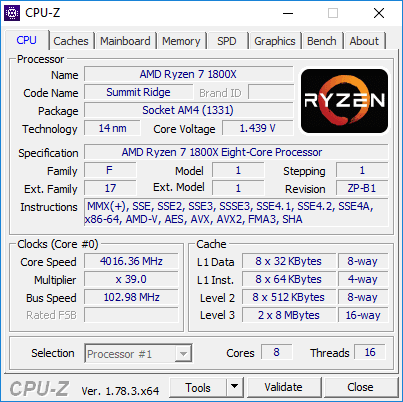 In my testing, I was able to bring the Ryzen 7 1800X slightly above 4.0GHz with a multiplier of x39 and a bus speed of just under 103MHz at 1.439V. With proper tweaking I believe it should be able to hit 4GHz at a lower voltage. From a cooling standpoint my Phanteks TC14-PE air cooler was able to keep the processor rather cool at 80C despite the +20 temperature reporting offset in Ryzen 7 1700X and 1800X CPUs. Looking at Cinebench, we see Ryzen absolutely stomping the older Intel Core i7-5820K. 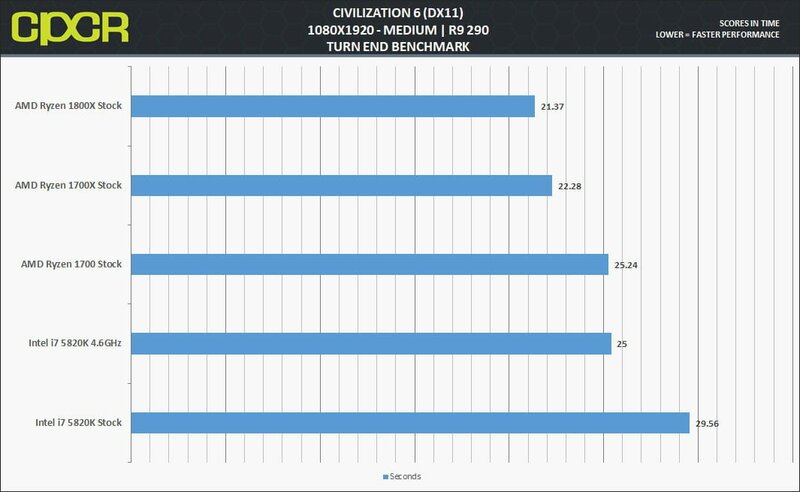 From AMD’s last generation flagship, we see an almost 120% increase in performance from the AMD FX-9590 to the AMD Ryzen 1800X which shows how far AMD has come. 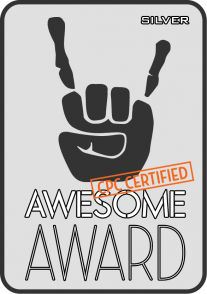 Blender is one of the most popular 3D rendering applications out today and the best open source by far. 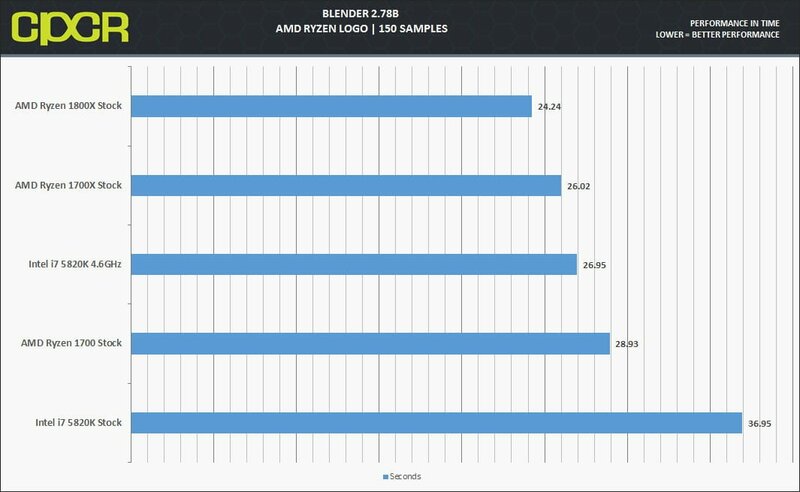 We are using the same blender file used by AMD when they originally compared Ryzen to the 6900K we use 150 samples. Here we see the overclocked Intel Core i7-5820K get beat by the AMD Ryzen 7 1700X and 1800X at stock. 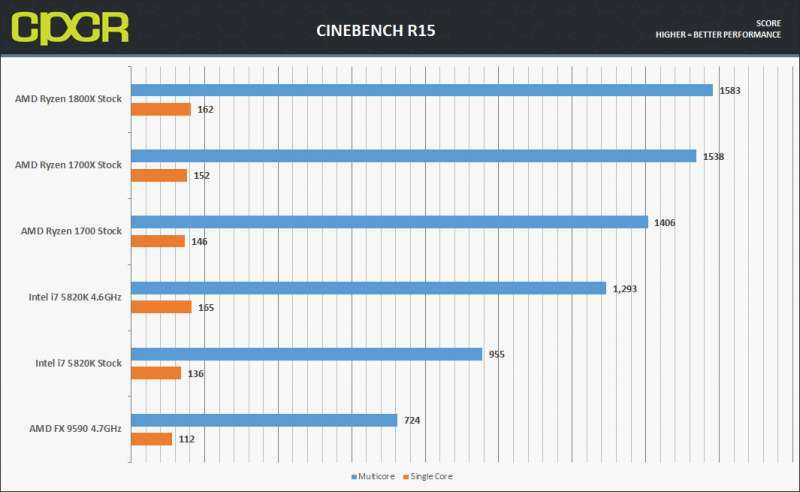 In single core performance, the massive overclock of the Intel Core i7-5820K was able to easily pull ahead of the pack, but is slower than the Ryzen 1700 at stock. Here we also see that the Ryzen 7 1700X beats out the non X variant by 15% and the Ryzen 7 1800X beats out the Ryzen 7 1700 by 23%. 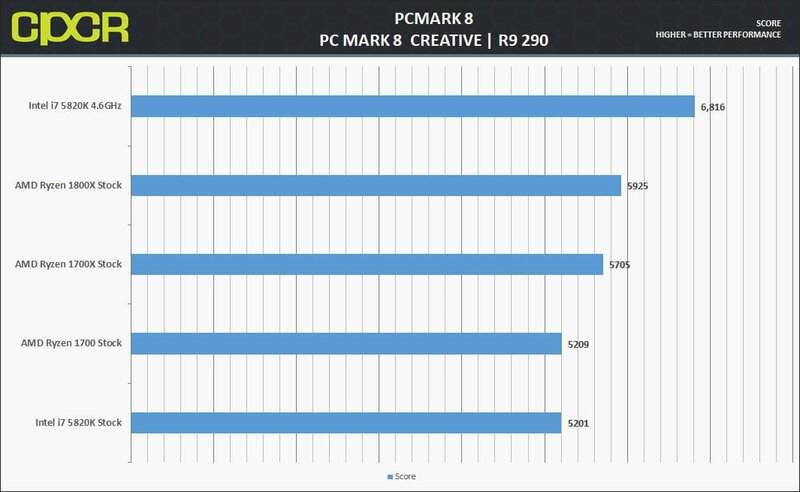 Interestingly the overclocked Intel Core-i7 5820K only beats out the Ryzen 7 1800X by 5%. Here we see Intel pull ahead since PCmark still strongly favors clock speed over cores. The Ryzen 7 1800X loses by 16% to the overclocked Intel Core i7-5820K and the Ryzen 7 1700X loses by about the same as well. 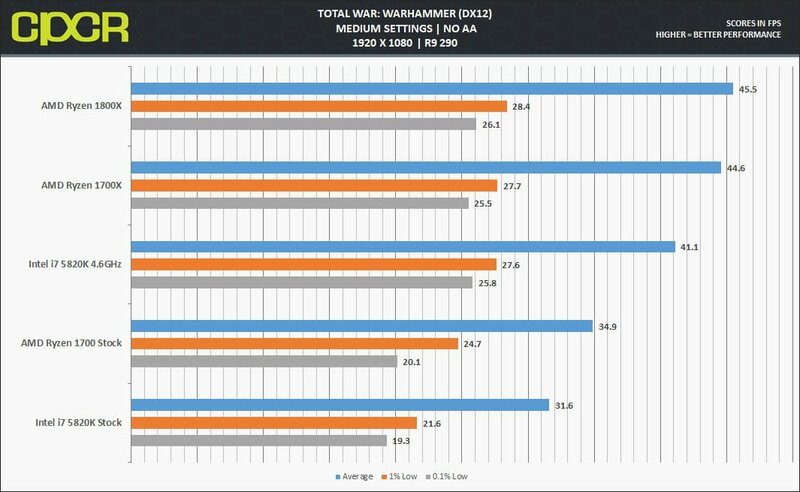 At stock, the Ryzen 7 1700 and the Intel Core i7-5820K perform relatively on par. 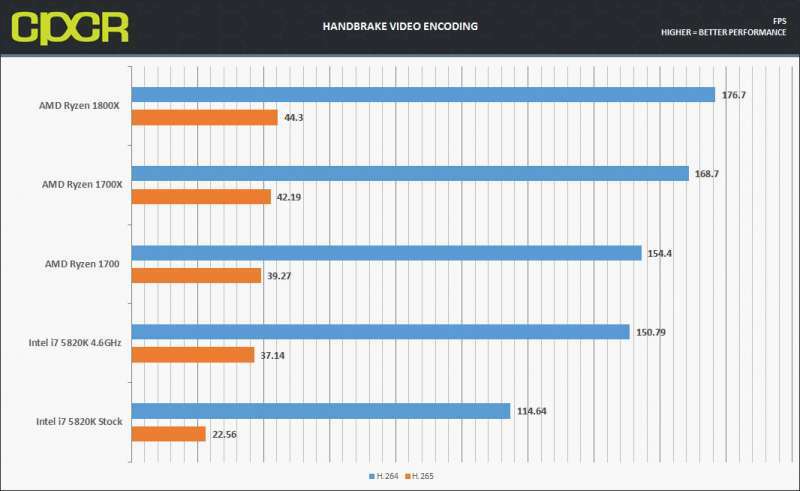 For those on the cutting edge of Video encoding H.265 allows even greater file compression at no quality loss, although incredibly system intensive it is the future of video compression and we test it here using Handbrake. This time we see an almost 15% jump from the Ryzen 7 1700 to the Ryzen 7 1800X in H.264 and a 20% increase in H.265 while the Ryzen 7 1700X sees a 15% jump in H.265 and a 10% jump in H.264. 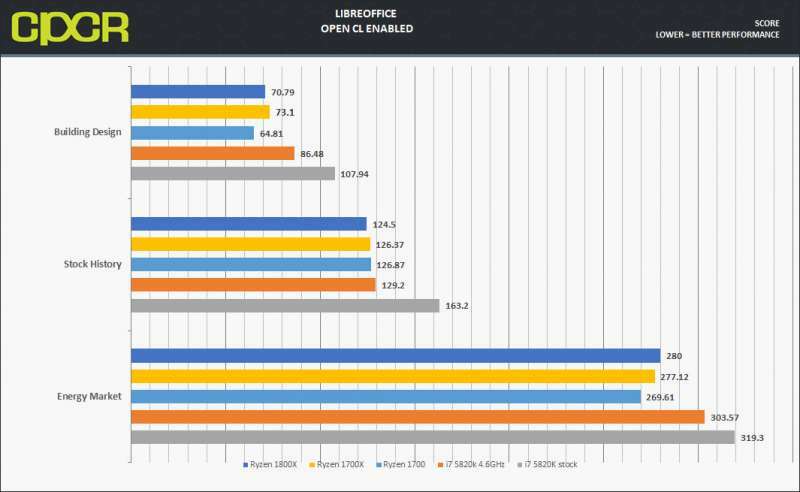 Again the more expensive SKUs have shrinking gains in performance, while just destroying the Hexa-core Intel Core i7-5820K. In this setting we use a variety of tests based on different used case scenarios such as urban planning, stock trading and sales. Very odd performance we see here as the Energy Market test showed worse performance with the higher clocked Ryzen processors. In the Stock History test, performance is similar between all Ryzen 7 parts with the stock Intel Core i7-5820K outpacing the competition. 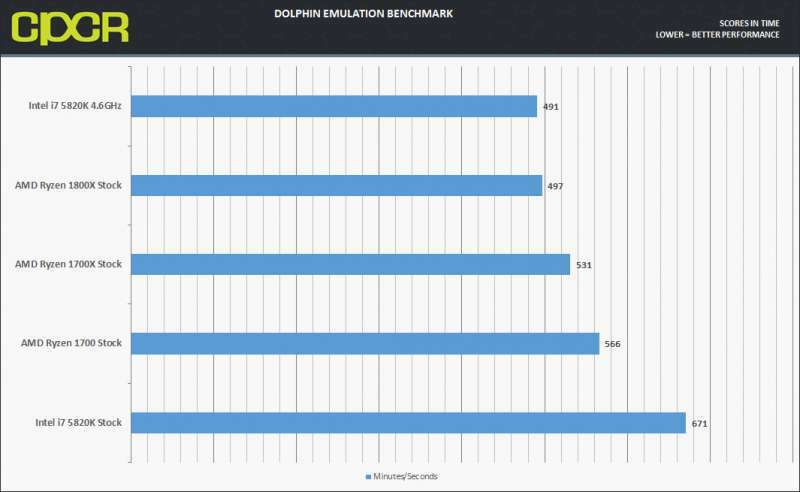 Overall the Ryzen 7 1700 seems to be the best here, as it appears XFR may not be engaging properly. .
Dolphin is by far the most popular Gamecube and Wii emulator with one of the most well developed and strong communities on the net. Emulators have been known to be incredibly bottlenecked by single threaded performance. This benchmark runs a Wii program that raytraces a complex 3d scene inside the emulator, this is a very intensive task on one core. Results are given in time. As Dolphin is mostly single core benchmark, the Intel Core-i7 5820K overclocked came out on top, edging out the Ryzen 7 1800X ever so slightly. The Ryzen 7 1700X finished 7% slower and the Ryzen 7 1700 about 13% slower. The stock Intel Core i7-5820K however, came in at the bottom of the chart. 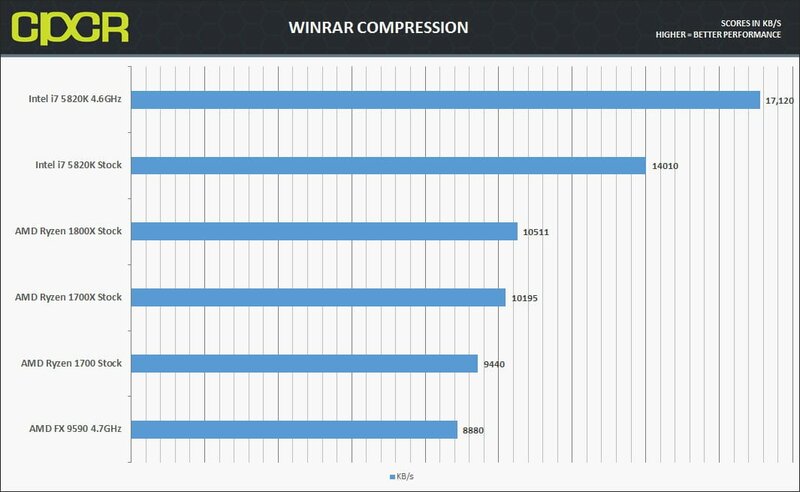 Not sure if it’s a lack of software optimizations, but Ryzen gets destroyed in Winrar as the Ryzen 7 1800X loses to the Intel Core i7-5820K at stock by 40% and 70% when the i7 is overclocked. The difference between the 1800X and 1700X are more or less the same. Rainbow Six Siege is one of the most popular shooters out today. 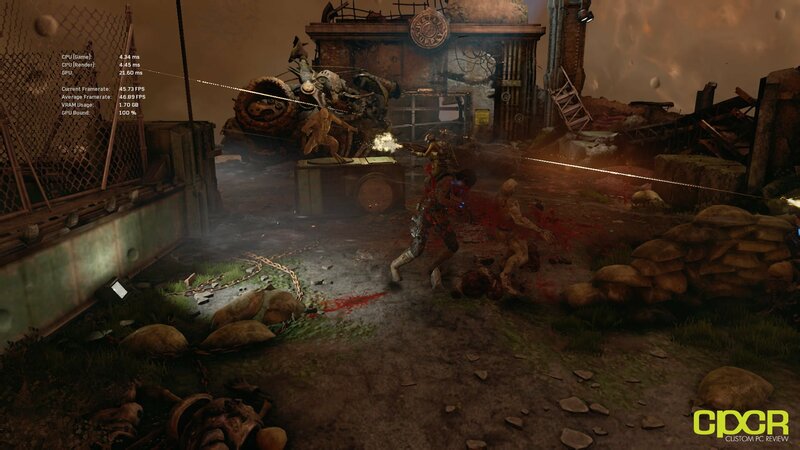 Using Ubisoft’s AnvilNext2.0 engine. Solid multicore utilization, along with lots of physics-based environmental destruction, particle effects such as smoke and fire and, fast paced action makes this for one spectacular CPU gaming benchmark. 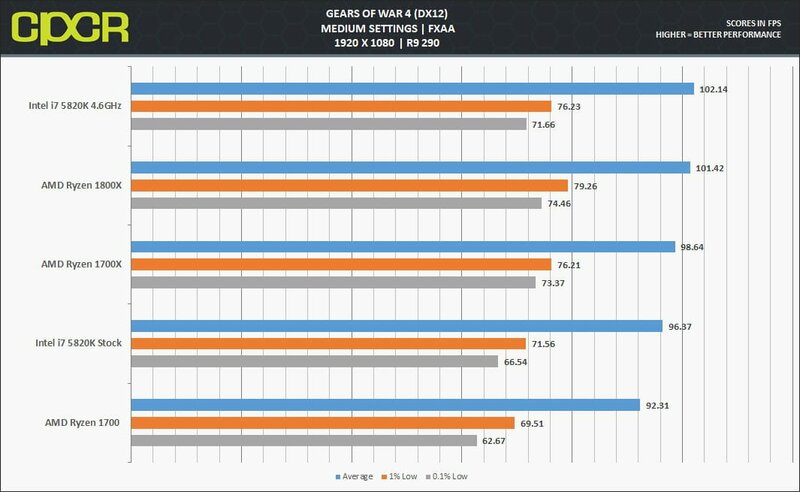 Here we see nearly equal performance even at 1080P and medium settings as the game seems to be rather GPU bound. The latest title from Creative Assembly’s Total War series is set in The games workshop Warhammer universe, This like many of the Total War RTS titles before it is a very CPU dependent game and is known even in DX 12 mode to be very single core dependent. Our testing is done using a large custom Battle replay with 4 armies at max unit size with almost 10 thousand units smashing into eachother, this one taxes the CPU more than any other scenario I’ve been able to come up with. 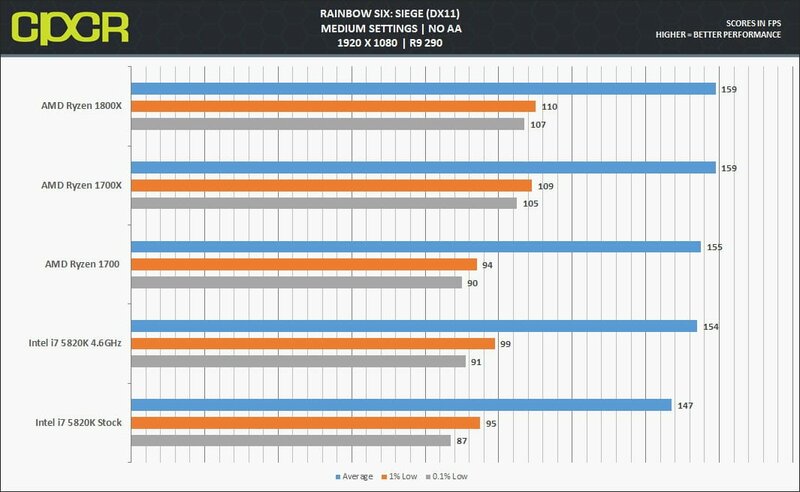 Here we see the Ryzen 7 X models having a solid improvement over the Ryzen 7 1700 and even beating the overclocked Intel Core i7-5820K. Here, it seems like clock speed is most important. Here we see the highly overclocked Intel Core i7-5820K barely beats the Ryzen 7 1800x in average FPS but loses to the Ryzen 7 1800X and 1700X in .01% low and 1% low. Here we see again that this seems to be almost totally GPU bound, and again once we get a higher end GPU we will test this game again. Although it can be noted that Ryzen seems to have better .01% lows than the Intel CPUs and Ryzen does seem to give better minimums and have less frame time variance. 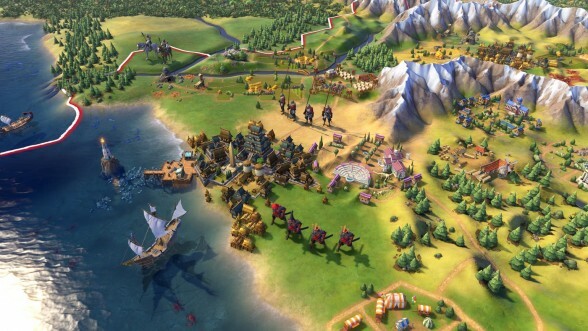 in the newest title from Firaxis incredibly popular Civilization franchise Civilization VI. 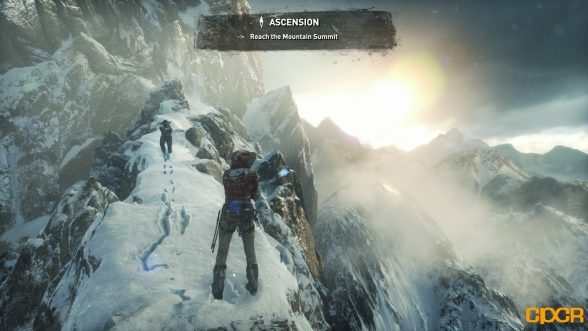 Using the newest iteration of the Firaxis engine it includes higher resolution textures and a whole host of gameplay changes. Civilization is known for being CPU hungry and as a turn based strategy game generally a high frame rate isn’t needed to play optimally, as such most people complain about late game performance waiting for turns to end which is a CPU bottleneck. Thanks to Civ’s new benchmark program we get to test exactly that. A late game scenario which runs 5 turns and gives us an average time to turn end, this is what we test here. Here we see that the higher core count and cache counts for more than the absolute higher clock speed on the Intel Core i7-5820K at 4.6GHz. Ryzen definitely gets the win here. We see a 12% delta between the Ryzen 7 1700 and 1700X and a less than 5% delta between the Ryzen 7 1800X. Having spent the past few months with the Ryzen 7 1800X as my production platform, I’d have to say that the Ryzen 7 series in general is very impressive and a solid offering from AMD. In my real world testing, the Ryzen 7 1800X was able to handle everything from browsing the web to gaming to video editing effortlessly and despite a few issues we’ll discuss in a bit, AMD has set itself up to take back some considerable marketshare from Intel. Over the past few months, one of the biggest topics I’ve seen come up from countless reviews and forum posts is the comparison of Ryzen 7 to Intel’s mainstream platform in gaming. 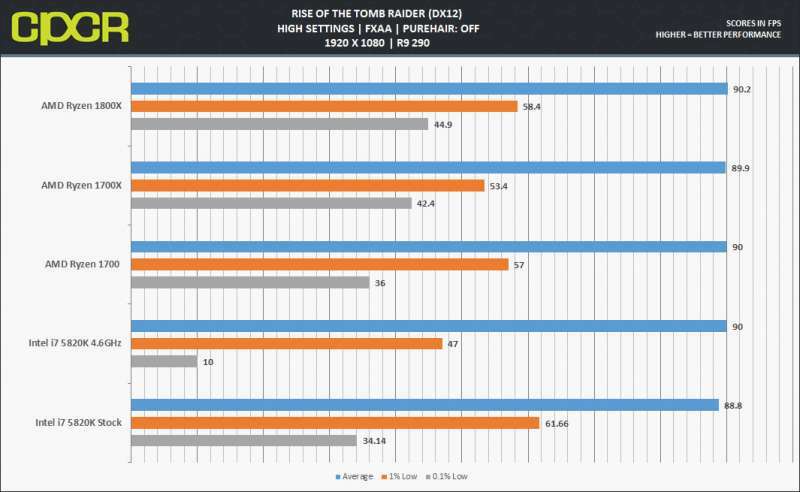 Most have pointed out how Intel is better suited for gaming which is true much in the way that Intel’s HEDT X99 and X79 platforms were always a bit behind in gaming performance. Intel’s mainstream parts are simply clocked at higher frequencies which are beneficial for games that are coded to use just one or two cores. However, as games become more multi-threading enabled and optimized for Ryzen, I believe that Ryzen will ultimately be as good if not better than its counterparts down the road. Whether you want to take the gamble on Ryzen for the long haul of course is something you’ll have to decide for yourself. As someone who used the Ryzen 7 1800X in a production platform rather than just simply a test bench, it has not been all fun and games on Ryzen. For example, in my testing, I’ve had consistent crashing issues related to memory which got better with BIOS updates, but only truly stopped with a kit of GeIL EVO X DDR4 memory. At this point most motherboards will have much better memory support and a lot of the early teething issues with the platform are over however, the fact remains that Ryzen is a newer platform that simply hasn’t had the same amount of time to mature as its Intel counterparts. That said, kudos to the AMD team which has released regular community updates (up to #4 now) with hosts of fixes in each one. While it’s unacceptable that any product has issues, it does happen in highly complex products like CPUs and it does inspire confidence knowing that AMD is working hard on listening to the community and getting issues resolved. Sitting squarely between $500 and $330 with 8 cores and 16 threads, Ryzen 7 CPUs compete with Intels Broadwell-E, Haswell-E, and down the line Intel’s Skylake-X and Kaby Lake X. Comparing between Ryzen 7 and Intel Haswell-E/Broadwell-E, there’s no reason not to recommend purchasing Ryzen 7 as the two extra cores and four extra threads really show their worth in multi-threaded tasks and multitasking, which is the primary reason for purchasing Intel’s HEDT platform. 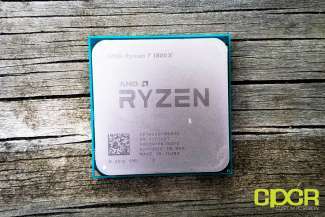 Compared to the AMD Ryzen 1700 I reviewed, the AMD Ryzen 1700X and 1800X don’t seem to justify the added cost given that the Ryzen 1700 can simply be overclocked to reach similar performance to its X-rated family members. 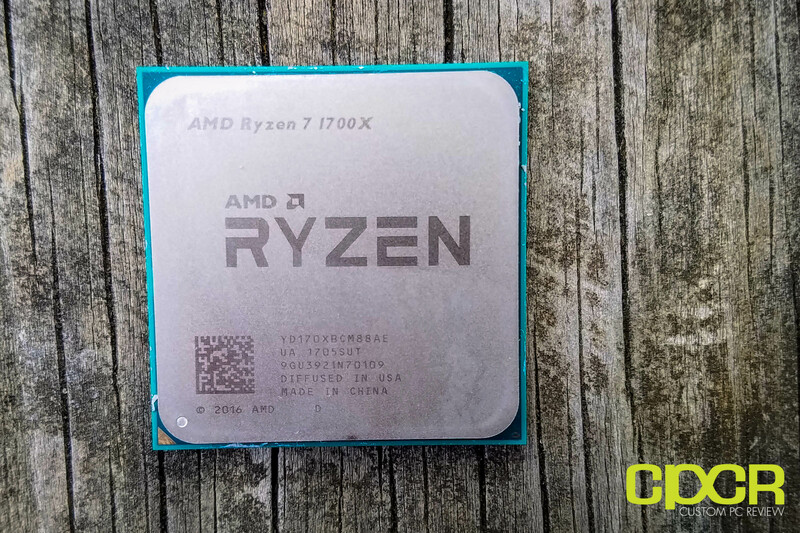 However, those who are a little leery of overclocking and getting under the hood, the Ryzen 7 1700X and 1800X offer the best performance out of the box. 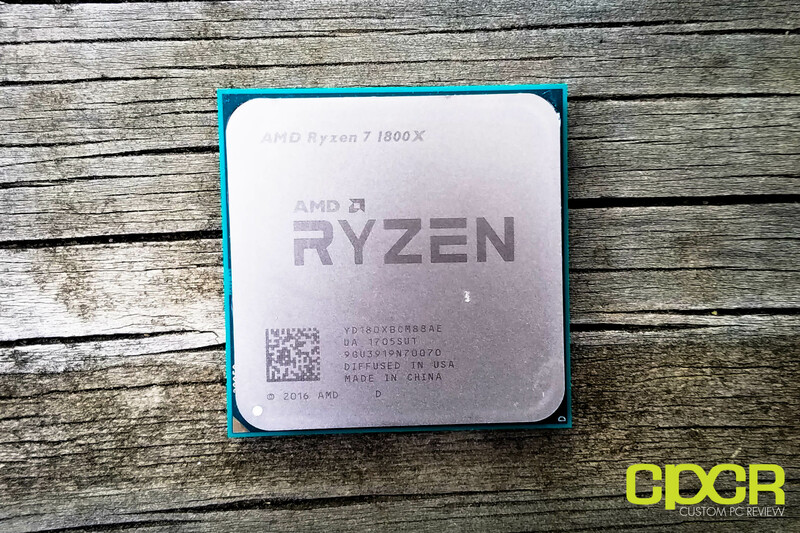 Further for the enthusiast overclockers, the Ryzen 7 1800X seems to be the best binned out of all the SKUs, making it a prime choice for those who are looking to get the best overclocks. All in all, those looking for a new CPU for lots of multi-tasking, running multi-threaded applications, video streaming, content creation, etc. the AMD Ryzen 7 1700X and AMD Ryzen 1800X are excellent choices for the task. However, my strong recommendation for the AMD Ryzen 1700 remains the same as well, especially if you’re planning to overclock your system and save a couple bucks in the process.